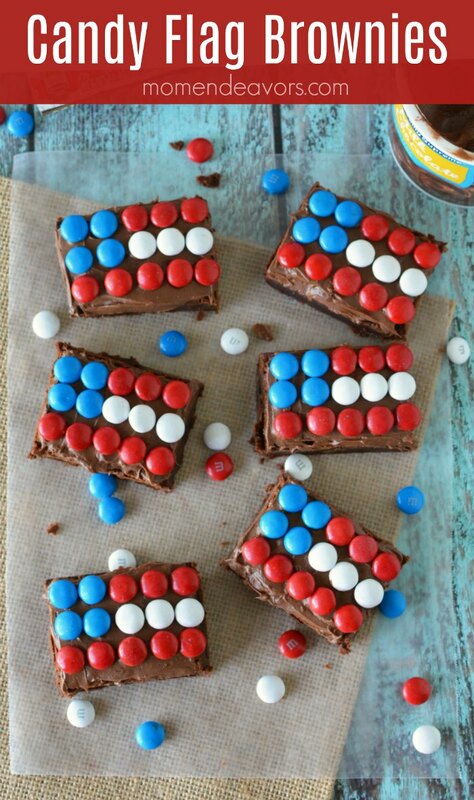 These candy flag brownies are so easy to make for a patriotic treat! Brownies are often my go-to party dessert of choice because they’re so easy to make. Just throw them in a pan, bake, and cut! Easy peasy! Plus, just about everyone seems to love them. 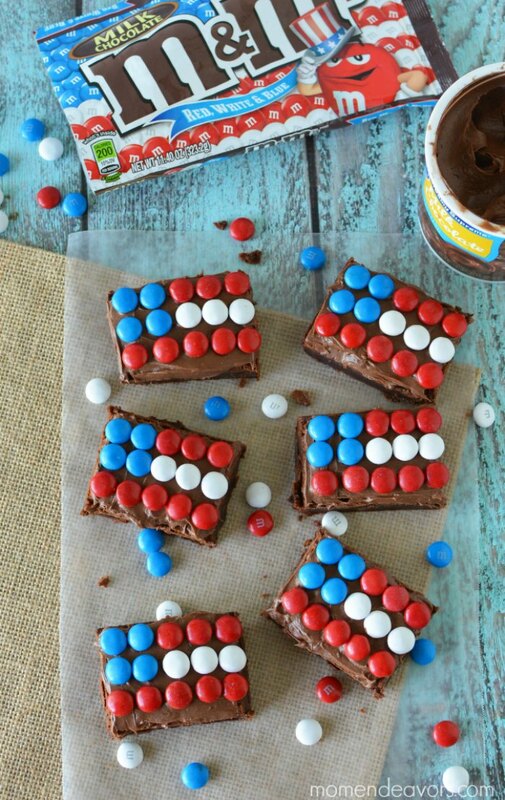 So with the 4th of July very rapidly approaching, I thought it would be a fun to share this cute idea for adding some patriotic flair to your brownies! A few candies and some chocolate frosting is all you need! Note: I like to use a pan scraper to cut brownies. Seems like it would take forever, but it goes very quickly and the brownies don’t stick to the plastic like they do a metal knife. I simply press from the top down, instead of dragging like you do a knife. In order to know what size to cut the brownies, arrange M&M Candies onto the top of a brownie area in the pan. 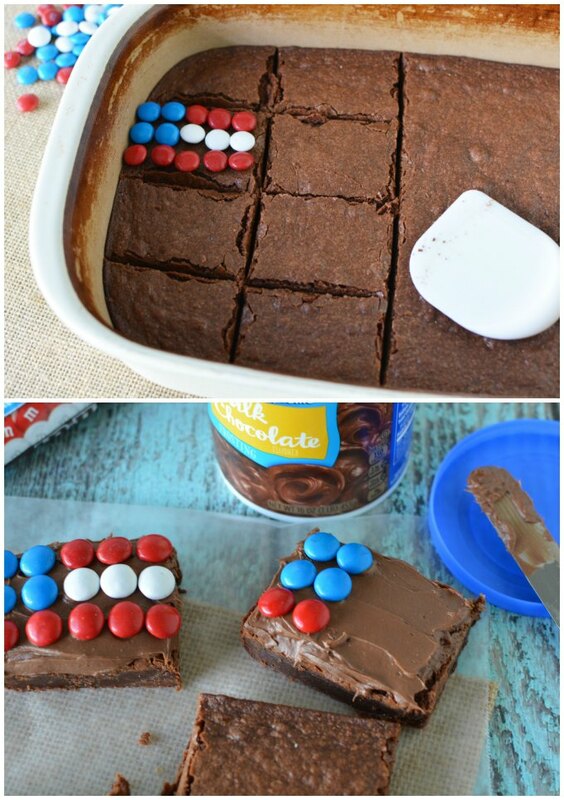 Use the pan scraper (or knife) to cut the right size brownies to fit your flag design. You may need to move your M&M candies to cut the next row of brownies. Once all brownies are cut, frost them generously with chocolate frosting. Place the candies onto the frosting and repeat until all your brownies are decorated. We wanted to keep these a little smaller, so didn’t have enough room for a second white stripe on most of them. But you really could make these a large as you want – a little longer to have the stripes extend a little farther or wider to have some more stripes. 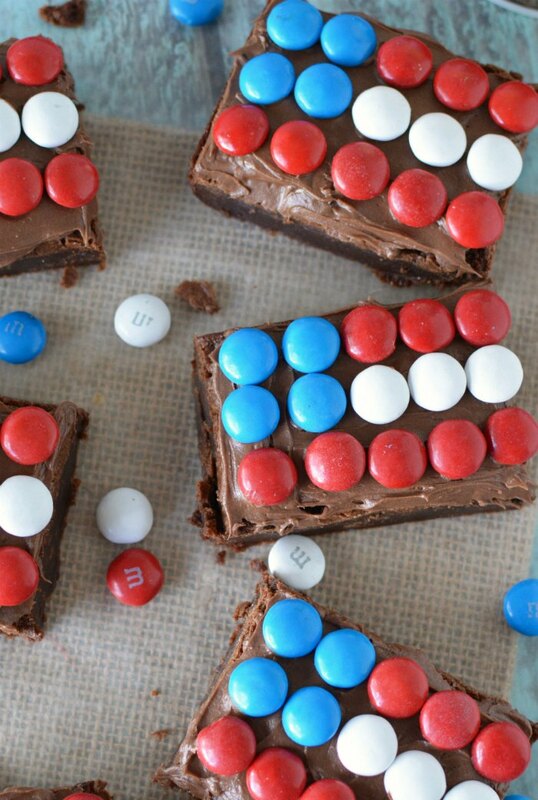 No matter how you do it though, these candy brownies are sure to be a hit! The red, white, and blue colors will look perfect at any of your 4th of July barbecues and parties! Happy 4th!